Rogers Hornsby was the first superstar player for the St. Louis Cardinals and later the first member of the franchise to be inducted into the Hall of Fame. As one of the all-time greats of the game, collectors will want to track down these ten Rogers Hornsby cards. During his 23-year career, Rogers Hornsby won two Triple Crowns, batted .400 three times, and is the only player in Major League history to slug 40 home runs in the same season that he eclipsed a .400 batting mark. His .424 average in 1924 still stands as a single-season record and his career average of .358 sits second all-time to Ty Cobb. Shop for Rogers Hornsby Cards on eBay. Although he spent thirteen years on the Cardinals, and a large portion of Rogers Hornsby cards feature him with St. Louis, vintage collectors can also find cards from his time with the New York Giants, Boston Braves, Chicago Cubs, Cincinnati Reds, and St. Louis Browns. Modern collectors are also in luck as Rogers Hornsby has been featured in multiple new card products, some of which include relic cards and cut signatures for the Hall of Famer. This Rogers Hornsby top ten list provides collectors with a wide range of baseball cards from early in Hornsby's career, through his time spent as a manager, and into his continued popularity following his playing career. Rogers Hornsby was included in 1972 Kellogg's All-Time Greats, which was more limited than some of their other baseball card issues of the 1970s and 80s due to the fact that collectors had to complete a mail-in offer in order to receive the set. It also offered collectors a chance to own a 15-card set which featured 14 Hall of Famers on the checklist. The cards can have some condition issues with the plastic on the front cracking or splitting at times. 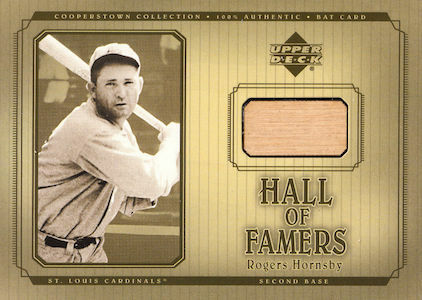 Hornsby has had numerous relic cards issued over the years, and while most are extremely limited in print run and high in price, his Upper Deck Hall of Fame bat relic breaks the mold. This Upper Deck product offered collectors a chance at one Hall of Fame relic per box, none of which were serial numbered. While there were short prints in the relic set, Hornsby's bat card was not among them, making this card both easy to find and affordable to purchase. In 1960, Topps had the exclusive rights to the current MLB players, but Fleer issued their Baseball Greats product to circumvent that license by using retired players. 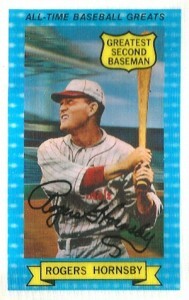 Although he was not included in the 1960 edition, Rogers Hornsby is part of the 1961 Fleer Baseball Greats checklist. Not very popular at the time of release, they are now considered ground breaking for the hobby as the first sets which relied solely on retired players. 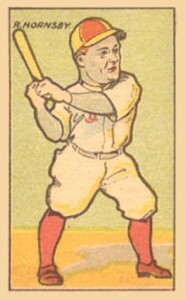 Rogers Hornsby appeared twice in the legendary 1933 Goudey set. The set was made popular with vintage collectors through its use of bright vibrant colors, abundance of Hall of Fame rookie cards, and multiple cards of star players. 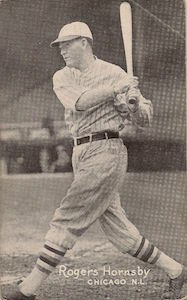 Hornsby, nearing the end of his playing career, started the year with the Cardinals. However, he was placed on waivers in the middle of the season and claimed by the St. Louis Browns who used Hornsby as a player and manager. He spent his final five seasons on the Browns, only appearing in 67 games as a player, but his second 1933 Goudey card marked an important transition in Hornsby career from his time as a player into a full-time role as just a manager. 1926-29 Exhibits was a postcard set was printed by the Exhibit Supply company over a four-year period. The set features black-and-white pictures on a 3 3/8 by 5 3/8 inch postcard stock. There were 68 cards in all, but the set featured three different Hornsby cards capturing him as a Cardinal, Brave, and Cub. Issued with sticks of caramel candy, the E120 set featured two distinct series of cards which were broken down into American and National League cards. 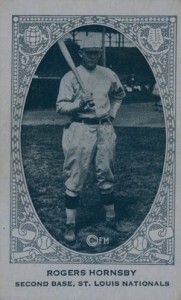 The American League cards were printed in sepia while the National League cards, including Hornsby, were printed in a bluish-green ink. The card stock used for this set was thin and has led to few of these cards surviving in good condition. There is also a similar card with a more generic look that is part of the 1922 E121 set. W-516 was a set of strip cards issued by International Feature Service that were hand-cut either by stores or card collectors. The set had three different series totaling 30 cards, with each set having a few slight differences with the pictures and labeling on the front of the card. 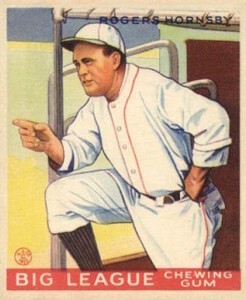 The Rogers Hornsby card was a part of the first series, with an artist-colored photograph and a handwritten label on the front of the card featuring the player's name, team, position, and card number. The backs of the cards were blank. 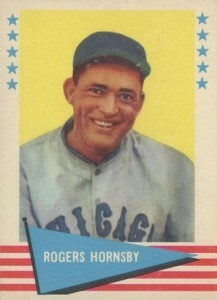 Since the cards were hand-labeled, there are numerous examples of these cards with player's names misspelled, including "Roger" Hornsby below. 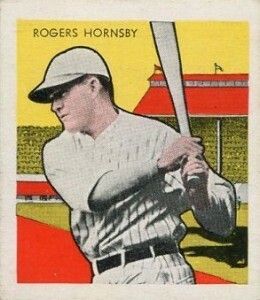 The 1933 Tattoo Orbit Rogers Hornsby card is one of his more unique cards. Tattoo Orbit was amongst the most distinct bubble gum sets due to the bright yellow, green and red backgrounds contrasting with black-and-white player photographs that have skin-colored hues added to the player's picture. This set was issued by the Orbit Gum Company and featured several tough short prints. While there are many Hall of Fame players in this set, the Hornsby card is the only short print to feature a player enshrined in Cooperstown. This is one of the more desirable Hornsby cards for vintage collectors and could be considered a 1A choice to the card in the first spot on this list. The Rogers Hornsby card was issued by the Collins-McCarthy Candy Company as a part of their sole venture into baseball cards. 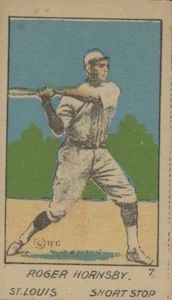 The black-and-white cards can also be found issued under the set name of the 1917 Boston Store set, but the cards are the same except for the advertisement on the backs of the cards. Several factors make this Hornsby card a difficult find, including the fact that the cards were never issued as a complete set to the public and were also printed on a cheap, thin card stock, which has increased wear and tear on these cards over time. The "Big Heads" cards have gained more and more traction with vintage collectors in recent years. The 1916 W-UNC strip cards feature unique art work of 20 players, including many Hall of Fame names. The main attribute of the drawings is that the players have abnormally large heads. Hence, the set has been nicknamed "Big Heads." 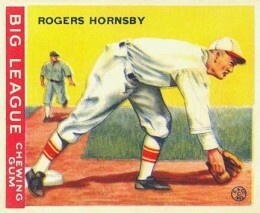 The Hornsby card in the set was his earliest issued card and came out during his first full season with the St. Louis Cardinals. 1933 Goudey #188 Rogers Hornsby HOF Browns SGC 1 !! 1933 Goudey #119 Rogers Hornsby HOF Cardinals SGC 1 !! 1921 E121 Series of 80 has to be one of the top 10. 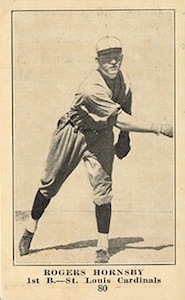 First card to use that image of Rogers that appears on his 1922 issues and later. 1931 W517 #38 Rogers Hornsby Cubs HOF SGC 2.5 ! !